Most frequently, diplexers are used when you have a single cable feed either up to the antenna or from one point thru a building to another building where it is not economical to run another cable. Example 1 – Diplexers are well-suited for major structures like the Empire State Building where multiple FM radio frequencies are multiplexed on to one antenna cable for broadcasting of their individual signals. Example 2 – Diplexers are an ideal solution for diplexing a satellite dish’s signal with the standard broadcast signals, or even with the CATV signal so that both signals can effectively enter a prewired single cabled home. Multiplexers provide the same function, but are used when more than three signals need to be separated or combined. The process – from the basic design to simulation – is controlled entirely by Corry Micronics’ in-house engineering team. ANSYS simulation software helps shorten the prototyping phase by typically allowing them to achieve the specified design with the first build. They own their own vertical CNC machining centers. Once simulation is complete and the 2D files are converted into 3D, the files are directly fed over the network to the CNC center to start cutting metal into the specified design. 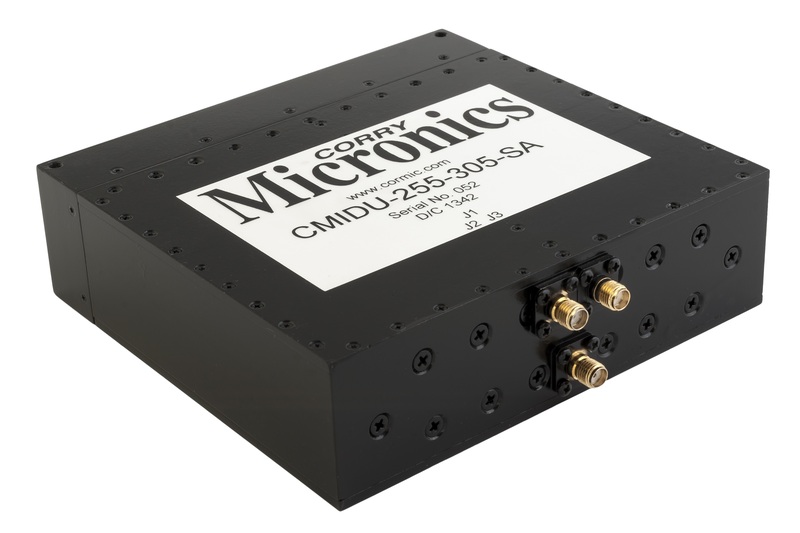 After the CNC process, Corry Micronics will either go to plating or straight to their in-house engineering lab for assembly and preliminary testing. They’re quick to respond to both electrical and mechanical preliminary designs. They’ll design for both low and high volume requirements. Contact Corry Micronics to discuss your diplexer/multiplexer needs and area of application. You can also download the available datasheet for information on features and specifications.You can also access individual model datasheets by clicking on the links below.